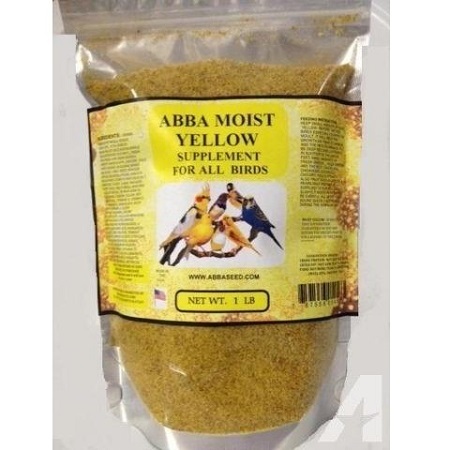 Food/Supplement for all Yellow birds. Keep a small amount of Moist Yellow in the cage with the yellow birds especially during the molt. It will help the growth of their plumage and the new plumage will be a deeper yellow. In addition to the above, feed small amounts of fresh greens of all kinds; the greater the variety of greens, the greater is the potential for success. Wild greens are the best: Dandelion, Chickweed, also Watercress, Escarole, Chicory, Kale and Spinach. Also fruit such as Apples and Pears. Moisten the Yellow supplement with warm water when offering it to the birds. Be careful; all moist food sours quickly, especially during the warm, muggy months. After moistening, if food is left over after 8 hours, change for new food.